Thanks for the report and pictures. St. Thomas looks quite beautiful. Glad to see you went to the old port rather than Crown Bay. A lot closer to town. Havensight is our first choice so I think you got lucky. Its been a couple of years since we've docked there. Since we were at Havensight, we decided to check out the shops there, since it had been at least 10 years since been at that docking area, instead of wandering about downtown as originally planned. We noticed that there were some more shops than before, but nothing out of the ordinary, just more of the same jewelry, clothing, etc. places as before. DW did find and buy a beach cover-up, and I looked at some Tommy Fauxhama shirts but did not buy any. We came back to the ship and lounged about on our balcony for most of the afternoon, then showered and dressed for pre-dinner drinks. The problem was, there was not a quiet bar open anywhere on the ship. The Sports Bar had TVs going. The Ocean Bar had happy hour and the HAL Cats starting at 4:00. The Crow’s Nest had Team Trivia scheduled for 4:30. The Lido Bar is never quiet in the afternoon, but even beyond that there was a steel drum sailaway party starting at 4. 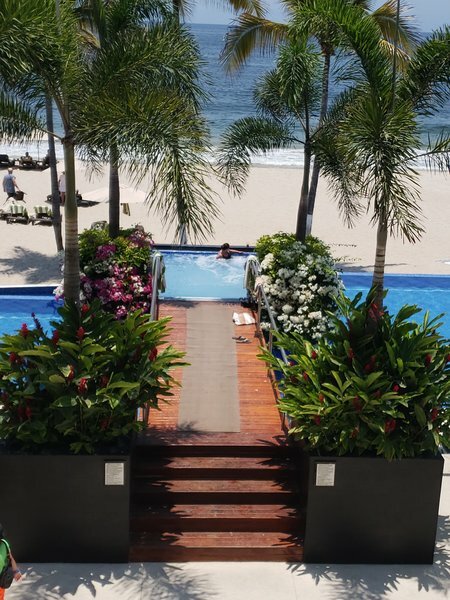 We settled on the Ocean Bar. The HAL Cats were pretty good, and we did notice that the ship has organized much more staff for happy hour, with a half-dozen attendants circulating, and at least two bartenders mixing, pouring (or de-capping) the drinks. It was still pretty hectic, but not totally madhouse. Tomorrow is an at-sea day, before the final full day at Half Moon Cay. We don’t have any wild plans beyond a latte at the Explorations Café. Appetizers: Banana and Orange Melange; Fruit de Mer on Vegetable Confit; Grilled Vegetables and Asiago; Beef and Chicken Satay. Soups and Salad: Pasta Fagioli; Cream of Cauliflower; Chilled Mixed Berry Soup; Tomato and Romaine Salad. Entrees: Fettucine Gorganzola; Cobb Salad; Spiced Shrimp and Cheesy Grits; Korean Kalbi Beef Short Ribs; Boneless Lamb Loin En Croute; Braised Chicken in Garlic and White Wine; Vegetable Lasagna. Desserts: “Noordam” Devil Chocolate Cake; Strawberry Romanoff; Rum Baba; Linzer Torte no sugar added; Vanilla Ice Cream; Strawberry Ice Cream; Raspberry Sorbet; Raspberry Frozen Yogurt; no sugar added Chocolate Fudge Ice Cream; no sugar added Vanilla Ice Cream; Raspberry Sundae . Vista Lounge: Comedian Scotty Mclean, 8:00 and 10:00 p.m. Ocean Bar: The HAL Cats, 4:00 – 6:00 p.m., 7:00-11:00 p.m.; Happy Hour 4:00-5:00 p.m.
Explorer’s Lounge: Adagio, 6:00-10:00 p.m.
Crow’s Nest: Solo guitarist David, 7:00 p.m. – 11:00 p.m.; Happy Hour 9:00-10:00 p.m.
Tonight’s Movie: Robot and Frank, Queen’s Lounge, 10:00 a.m., 1:00 p.m., 5:30 p.m.; Lido poolside 9:00 p.m. Afternoon Tea, MDR, 3:00 – 4:00 p.m.
Caribbean Sailaway Party, Lido Poolside, 4:00 p.m.
have loved reading your 'live from', dave! Dave, first off, thank you for your blog, we are going on the same cruise as yours on March 11th and your postings are very valuable to us. Exactly, where is Coconuts? Also, where is Pelican Village? We have been to the Waterfront Cafe on the far side of the Carrenage, but we did not know about Coconuts. 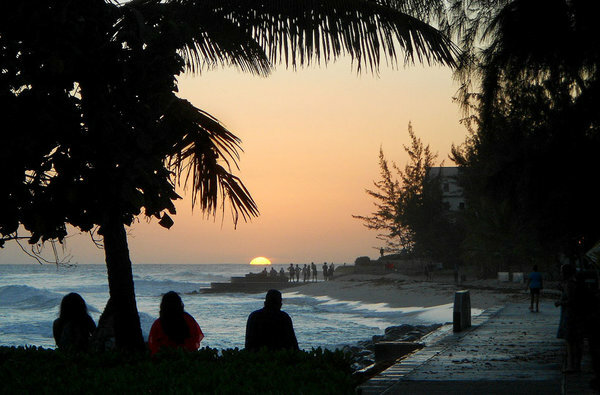 Not sure what we will do in Barbados, but a Banks and a flying fish sandwich sound good to us. Thanks for your reply and help!!!! Thanks for keeping us abrest of your cruise on the Noordam. It is coming to an end all too soon! Liked your photos of St. Thomas. Coconuts is a bar & grill with only outside tables. As you go through the Barbados cruise terminal, you wind around past all the shops and then out through the doors to where you can see taxis lined up. To the right is another small shops building, to the left is Coconuts; look for the tables and umbrellas. I you continue out past the taxis and clear the port gate, there is a sidewalk along the seafront that eventually leads you to town. About half-way there, across the street, is an area of shopping stalls and buildings called Pelican Village. I am just catching up with things. I remember Pelican Village. We walked there one time -- not much was open -- everything was boarded up. I'll have to take time and read back through this thread to see if things have changed there. Sorry, I never actually got there and did not take any photos ... my earlier post that mentioned it said I was heading to town for a sandich and got about as far as Pelican Village when I turned back to the port. I never went in this trip. You're welcome. I checked and I can see that you found your roll call. Cruise Critic can be a tad confusing until you get the hang of it but you will find it to be full of very helpful information. Your cruise looks as though it will be a lot of fun. I just read where the Noordam ended up in Havensight. Wish that would happen to us -- but it won't. Thanks for the blog Dave. Just read all of it in one sitting. Great job. Got especially interesting to me just yesterday when we rebooked a 7 day Eurodam starting March 9, 2014 for this same Noordam itinerary leaving on March 10 next year. Reading your reports is like taking that cruise a first time now before taking it again in real life next March. I'm glad you are enjoying the blog. I never have joined photobucket or other site, and just use the Cruise Critic Photo Gallery to upload photos. It's reachable by one of the links at the top of the forum, next to "User CP" "FAQ" and "Guidelines". It works for me. The maximum size is 250KB, which is about a 600x800 pixel photo, but that works for a blog. I belong to photobucket and that is the only way I can get pictures on here. I followed your directions above. When I checked onto Photo Gallery there was something about "register for free"??? I tried to upload 5 pictures -- nothing happened. No pictures anywhere and no message as to why I couldn't get the pictures to take. Did you gave to register there somewhere? Sorry, a key bit on info -- you have to be logged into Cruise Critic to use the Photo Gallery. If you did not log on when you went to the CC home page or the HAL forum, it should have a similar prompt on the PhotoGallery for you to log in. I think there are some FAQs about using the photo gallery, but it wasn't too hard to figure out. I am always logged onto CC. I did go to the Photo Gallery -- when I asked a question there -- everyone told me to join photobucket -- that's how I got started with them. We enjoyed a relaxing day, taking in some of the activities, but not many. We watched an artist turn a huge block of ice into a marlin-shaped centerpiece in about 15 minutes; we looked at the things for sale at the Lido tables for about 2 minutes, and we spent a lot more time just watching and listening to the sea going by. One event was not scheduled today, and it surprised us a bit – there was no debarkation talk, with the details on the baggage tags, how to fill out the questionnaire, the awful jokes, etc. Maybe they plan to do that tomorrow, but it seems unusual they would set that for the Half Moon Cay day. We have been on a few cruises where passengers have had service animals, and we have one on board this cruise, Rana, a beautiful golden-haired setter who is a service animal for a blind person. We had wondered just what arrangements were made for the animals. We learned how Noordam does it the first time we walked the promenade deck – they have set up an area for the dog along the forward bulkhead of the walk-around; today I took a picture and have attached it. I had mentioned that we preferred the string quartet to the current duo. That is not to say that the two ladies are not talented, they are accomplished pianist and violinist respectively. It’s just that some pieces are better scored for a quartet. But, on Tuesday evening, the duo played a very good rendition of Strauss’ waltzes that worked very well. We saw several flying fish today (no, really!). Those guys are even harder to capture with a camera than the whales were! I failed miserably at getting a shot with an image large enough to show something resembling a fish instead of a speck. They would launch themselves away from the ship, some flying an amazing distance before diving/falling back into the water. It is mesmerizing to watch them. Have thoroughly enjoyed your posts. My hubby and I board the Noordam on Friday for the 21 day cruise. You have greatly illuminated some of the ports for us. Thank You very much. So looking forward to this cruise. I also want to thank you, Dave - boarding Friday for the 10 day cruise with my mom. She's a 4 star Mariner but hasn't been cruising for a couple of years and never on this Noordam. I've been studying all your blogs to help her readjust to HAL. You've been a great help - and glad to know no problems with the ship! 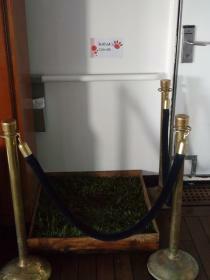 We have seen those "grass boxes" for the dogs on several ships. But never with them roped off. Not much else to report for today. We enjoyed the afternoon and then changed into formal for the Farewell Dinner. After that, we hit the slots a bit and listened to Adagio for a few minutes. The Explorer’s Lounge was a bit more crowded than normal, I think both because it was the last formal dinner and more people were waiting to be called for open seating dinner, and also because the Pinnacle Bar was closed while staff members set up for tonight’s Dessert Extravaganza. The daily program said it would be held in the Atrium on all three levels. Another random observation: I have been writing my comments in Word and then logging on long enough to cut and paste my posts. I have concentrated on answering questions you may have, with the slow connections at sea. I have seen all your comments, though, and appreciate all the encouragement, even if I have not acknowledged them individually. Appetizers: Fresh Fruit with Peach Schnapps; Jumbo Shrimp Cocktail; Duck Pate, Caviar and Smoke Salmon; Escargot Bourguignnone . Soups and Salad: Chicken and Wild Rice Soup; Tomato and Fennel Soup; Chilled Anjou Pear Soup; Mixed Greens Salad with Fresh Pear. Entrees: Mushroom Ravioli; Grilled Chinese Five Spice Salmon and Crispy Tortilla Salad; Grilled Mahi-Mahi with Roasted Corn Salsa; Surf and Turf; Apple Cider-Brined Pork Chop with Cherry-Raisin Chutney; Parmesan-Crusted Turkey Tenderloin; Chiles Rellenos. Desserts: Master Chef Rudi’s “Premiere”; Pear Caramel Mille-Feuille; Souffle au Grand Marinier; Passion Fruit Mousse Torte no sugar added; Vanilla Ice Cream; Strawberry Ice Cream; Watermelon Sorbet; Raspberry Frozen Yogurt; no sugar added Coffee Ice Cream; no sugar added Vanilla Ice Cream; The Master Chef’s Sundae . Vista Lounge: A Pescial Afternoon Concert with Paul Pappas on the Piano, 2:00 p.m.; The Noordam Singers & Dancers in “That’s Vegas”, 8:00 and 10:00 p.m.
Crow’s Nest: Solo guitarist David, 8:00 p.m. – 11:00 p.m.; Happy Hour 9:00-10:00 p.m.
Tonight’s Movie: The Words, Lido poolside 7:00 p.m., 9:00 p.m. & 11:00 p.m.
Royal DutchTea, MDR, 3:00 – 4:00 p.m.
Dessert Extravaganza, Atrium decks 1, 2 &3, 10:30 – 11:30 p.m.
As an animal lover, I am so glad they provide such good service for the "special companion animals" that are on board!